Salt used on walkways and roadways can be detrimental to the health of your lawn. If an excessive amount of salt gets onto your lawn, the grass may die out. Salt is used in the culinary art to bring out the flavours in food. But, too much salt in your diet can lead to high blood pressure and other health issues. Too much snow on the walks or roads can become a hazard and present problems for safe use of the sidewalks and roadways. In removing snow, too much snow shoveling can be unhealthy if it causes undue exertion. That exertion can affect your blood pressure and cause a heart attack. So when it's a choice between shoveling the walkway or using a lot of salt instead, some choices may have to be made to balance safety and health. Getting someone else to move the snow is one way to have a safe path and avoid exertion. And, yes, sometimes using salt on the walkway is prudent. This is especially so if the snow has turned into ice. Salt is often used because it will melt snow and ice. Give it a bit of time, maybe a little sunshine and the walkway will be free of ice and snow. However, if the salt ends up on the lawn, it can affect the health of the grass. 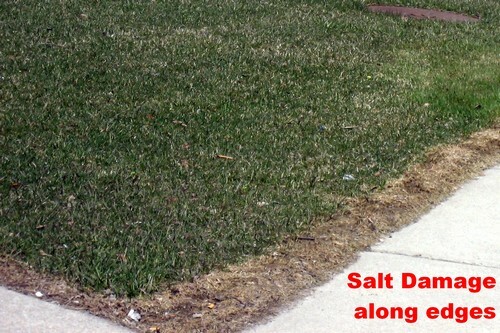 Salt can end up on lawns if a mixture of snow and salt is moved off of the walkway and piled on the lawns. Sometimes, salt has been applied and then more snow falls. The new snow and the old salt are pushed or piled onto the lawn. Salt can also end up damaging the lawn by getting onto the edges of the lawn. Often the walkway or driveway may be sloped. The salt or a snow/salt mixture ends up along the edge of the grass. 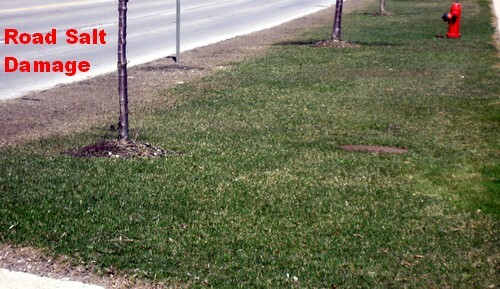 In the spring, the edges of the lawn have died off and you are left with bare or dead spots. The rest of the lawn turns green and starts to grow, but the edges where the salt has ended up on the lawn will die off. The lack of turf in these areas disrupts the beauty of a lawn that is starting to green up in the spring. To repair the damage, some fresh soil or peat moss should be spread out along the bare and thin areas. Some good quality grass seed must be sprinkled along the edge. Rake lightly to lightly cover the seeds. Keep moist for a couple of weeks. The new grass will soon sprout and fill in the bare patches. An application of Turf King's LOGI-CAL gypsum will help helpful in counteracting the effects of the excessive salt. In fact, applying the gypsum in the fall before the snow comes will prevent much of the salt damage. Turf King Hamilton regularly applies Turf King's LOGI-CAL gypsum to several properties that have had perennial salt damage issues. This improves their lawn and makes their lawn care program all the more effective. Other ways to minimize salt damage to lawn is to use products that do not damage lawns. Sometimes using sand is enough to ensure safe walking and driving without the use of salt. Other ice melting products are available. These products are less harmful to lawns. The disadvantage is that they are more costly than salt. If, however, the extra cost is less than the cost of repairing the lawn damage, the safer products may be worthwhile. The overall consideration is to have the lawn looking as good as possible while minimizing the cost and effort of your lawn care program. Turf King's LOGI-CAL soil supplement contains gypsum and can be used to help with salt problems.